Yet another entry to the Illogicopedia articles (Toilet) Roll of Honour. A strange one, in more ways than one. To start, who'd have thought such a repetitive, contentless article would make it to the ranks of Illogicopedian Classic? Well, it's not so much for its quality that this article is featured here, more for its backstory. Ung! 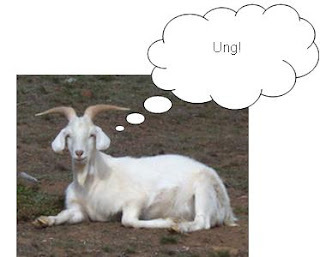 Goat started life on the Uncyclopedia where it was created by a certain metal person. It was quickly deleted, but spotted by an administrator of a recently formed and particularly nonsensical encyclopedia, which was on the lookout for new editors. Upon suggestion of the Illogicopedia to the author, the article was recreated there, where it has stayed to this day. The rest, so they say, is history: the creator in question has become one of the site's most esteemed contributors alongside such greats as Francis E Dec and Andre Breton, earning administrator status in record time. Well, it was quicker than a penguin attempting to open a fridge anyway. But what about the article, Yak? Well, it may not be the best ever (in fact chances are it would be deleted/Mexicanised today), but it certainly has a place in Illogicopedia's history as one of its earliest, and craziest pages.